The Dungeness nuclear power station sits amongst a desert-like landscape. The last time we made the trek out to Dungeness was New Year’s Day, 2017. It was beyond cold, unforgiving and bleak with biting winds. So much so in fact that we ended up seeking refuge inside a steamy and warm cafe in Rye, though not before I braved it to get a few shots of The Pobble House. We returned last weekend in warmer climes to explore further and lose ourselves for the day. If you’ve an unexplained hankering for desolate, post-apocalyptic landscapes as I do, I needn’t have to explain too much as to why so many others are drawn to Dungeness. Aptly named The Fifth Continent, there is a real sense of resilience here, a place that feels so baron it’s a wonder anything grows, but it does. Wildflowers push through the shingle defiantly and the heady coconut scent of gorse is everywhere. A landscape as flat as a pancake with nothing to see for miles but the coastline and scrubland, you’ll find the power station, the two lighthouses (one of which you can climb for stunning views) and a hotch-potch of private homes. Dotted about the shingle beach are remains of derelict fisherman’s shacks, sculpture-like rusting machinery and abandoned boats. If you want to find somewhere to get lost within yourself, this is the place to go. The view across the English Channel from the top of the lighthouse. PS1 – an architect designed renovation of a WW2 fuel pumping station. 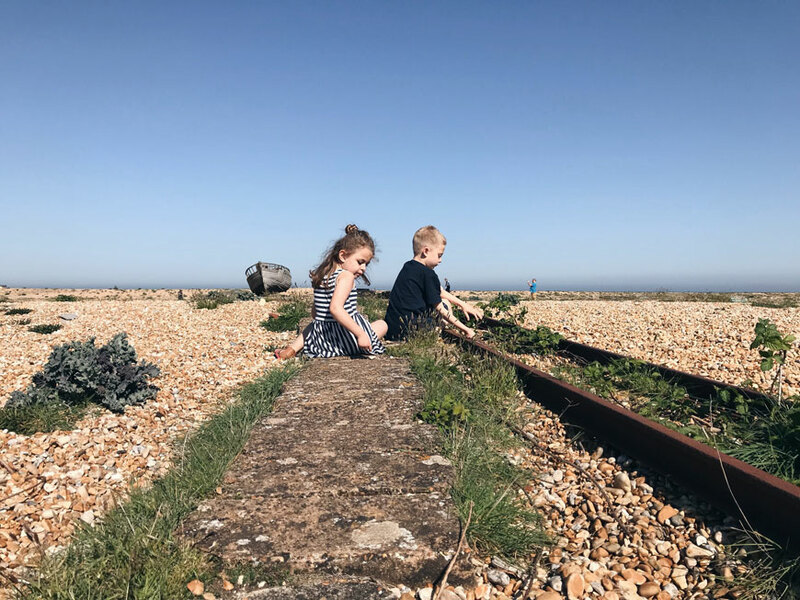 You wouldn’t think that Dungeness could be a desirable location for architects, but the lure of this flat coastal setting has seen a number of contemporary, black and corroded steel builds rising up from the shingle. Built with sensitivity for the history of the area, they look very much as though they belong here. And what I wouldn’t give to own one. PS1 – a former WW2 fuel pumping station. The Shingle House – designed by Scottish studio NORD. Pobble House – an award-winning home with views across the English Channel. Coastguard Lookout – a converted 1950s coastguard tower. Director, creative and gardener Derek Jarman’s coastal home, Prospect Cottage. There are no formal boundaries marked by fencing as you would expect and with no defined gardens it can feel a little sneaky picking your way across the shingle beach, unsure as to what’s private and what’s not. The famous Prospect Cottage and garden of the late Derek Jarman seems to appear out from the landscape as if it had always been there, dotted with reclaimed beach treasures turned sculptures. The yellow framed windows of his weathered, black cottage make the gorse ‘pop’ and are a beacon for art and garden enthusiasts who make the pilgrimage here. This garden is constantly evolving, rather than a shrine and Derek’s partner still lives here, changing the planting as the garden sees fit. I urge you to carve out some time to spend here this summer. It is a wilderness like no other. John Donne’s poem ‘The Rising Sun’ on the side of Prospect Cottage.